Lucius BRUMBACH was born in 1875 in Greenwich, , Ohio. He died on 6 Dec 1906. Lucius married Claire Hortense BASFORD. Claire Hortense BASFORD [Parents] was born on 18 Sep 1879 in Greenwich, , Ohio. She died on 5 Apr 1946 in Owensville, , Indiana. Claire married Lucius BRUMBACH. Theodore Walker CRAWFORD was born in Aug 1861 in , , Indiana. He died in Jun 1945. Theodore married Mary Elizabeth JONES on 16 Oct 1884 in , Gibson, Indiana. Mary Elizabeth JONES [Parents] was born on 22 May 1861 in Owensville, Gibson, Indiana. She died on 29 Apr 1932 in , Gibson, Indiana. Mary married Theodore Walker CRAWFORD on 16 Oct 1884 in , Gibson, Indiana. Eva M. CRAWFORD was born on 19 Oct 1885 in Owensville, Gibson, Indiana. She died in 1960. Franklin CRAWFORD was born on 29 Mar 1887 in Owensville, Gibson, Indiana. He died in Nov 1933. Opha T. CRAWFORD was born on 31 Jul 1889 in Owensville, Gibson, Indiana. Minnie J. CRAWFORD was born on 5 Feb 1892 in , Gibson, Indiana. Delia CRAWFORD was born on 5 Sep 1894 in Owensville, Gibson, Indiana. She died on 9 May 1971. Mary Mabel CRAWFORD was born on 19 Dec 1900 in , Gibson, Indiana. She died on 14 Jul 1901 in Montgomery, Gibson, Indiana. Grace CRAWFORD was born in 1901 in Owensville, Gibson, Indiana. She died in 1901 in Owensville, Gibson, Indiana. Guy A. RANDOLPH was born on 15 Nov 1873 in , De Wit, Illinois. He died on 9 Dec 1933 in Richmond, Richond, Virginia. Guy married Mary JONES on 19 Nov 1896 in , , Illinois. Mary JONES [Parents] was born on 24 Nov 1871 in , , Illinois. She died on 28 Sep 1950. Mary married Guy A. RANDOLPH on 19 Nov 1896 in , , Illinois. Virginia Pauline RANDOLPH was born on 6 Mar 1898 in Warrensburg, Macon, Illinois. She died on 4 Aug 1971 in Falls Church, Fairfax, Virginia. Warwick JONES [Parents] was born on 22 Oct 1863 in Midland City, DeWitt, Illinois. Warwick married Bertha B. FAITH. Bertha B. FAITH was born in 1882 in , , Indiana. Bertha married Warwick JONES. Charles JONES [Parents] was born on 13 Feb 1866 in , , Illinois. He died in 1951. Charles married Minnie B. "Grammy" CROSS on 14 Sep 1892 in , , Illinois. Minnie B. "Grammy" CROSS was born on 27 Jul 1868 in , , Illinois. Minnie married Charles JONES on 14 Sep 1892 in , , Illinois. Carl D. JONES was born on 3 Mar 1894 in , , Illinois. He died on 28 Dec 1926. Chella Lorne JONES was born on 13 Oct 1897. He died in 1966 in Tucson, Pima, Arizona. Floyd Leland JONES was born in 1902 in , , Illinois. Charles Kermit JONES was born on 19 Dec 1904. Permelia "Minnie" JONES was born on 20 Feb 1907. Wesley Allen JONES was born on 30 May 1910. He died in 1912. Joseph MAUCK was born on 7 Sep 1787 in Shenandoah, Virginia. He died on 9 Mar 1857 in Owensville, Gibson, Indiana. Joseph married Grace BROYLES on 15 Oct 1807 in , Washington, Tennessee. Grace BROYLES was born on 20 Dec 1791 in , Greene, Tennessee. She died on 1 Feb 1863 in , Gibson, Indiana. Grace married Joseph MAUCK on 15 Oct 1807 in , Washington, Tennessee. M i Abraham "Abram" MAUCK was born on 17 Feb 1821. He died on 12 Jan 1901. Thomas ROBERTS was born on 24 Mar 1806 in , Greene, Kentucky. He died on 5 Mar 1846 in , Gibson, Indiana. Thomas married Elizabeth MAUCK. 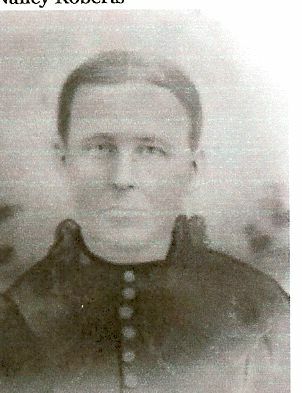 Elizabeth MAUCK [Parents] was born on 24 Feb 1853 in , Gibson, Indiana. She died before 1903 in , , Indiana. Elizabeth married Thomas ROBERTS. Enoch Adam HAGAR was born about 1840 in Boone, Boone, West Virginia. He died about 1864. He was buried in Enoch Hager Cemetery, Six Mile, Boone, West Virginia. Enoch married Nancy Jane ROBERTS. Nancy Jane ROBERTS [Parents] was born on 22 Jun 1844 in , Tuscaloosa, Alabama. She died on 10 Aug 1916 in Allen, Pontotoc, Oklahoma. She was buried on 12 Aug 1916 in Allen Cemetery, Allen, Pontotoc, Oklahoma. Nancy married Enoch Adam HAGAR. Enoch Adam HAGAR was born about 1840 in Boone, Boone, West Virginia. He died about 1864. He was buried in Enoch Hager Cemetery, Six Mile, Boone, West Virginia. Enoch married Nancy J. LUCAS. Nancy J. LUCAS was born about 1840 in Boone, Boone, West Virginia. She died on 2 Feb 1887 in , Boone, West Virginia. She was buried in Enoch Hager Cemetery, Six Mile, Boone, West Virginia. Nancy married Enoch Adam HAGAR. Minnie HAGAR was born in 1858 in , Boone, West Virginia. Lovena S. HAGAR was born about 1866 in Boone, Boone, West Virginia. Leona HAGAR was born about 1869 in , Boone, West Virginia. Henry T. HAGAR was born in Nov 1871 in , Boone, West Virginia. Wilson HAGAR was born about 1873 in , Boone, West Virginia. Robert A. HAGAR was born on 13 Apr 1874 in , Boone, West Virginia. William HAGAR was born in 1876 in Boone, Boone, West Virginia. Ulysses S. HAGAR was born on 9 Apr 1877 in , Boone, West Virginia. Lenora HAGAR was born about 1879 in , Boone, West Virginia. Lena HAGAR was born in 1879 in , Boone, West Virginia. James G. HAGAR was born on 16 Jan 1882 in , Boone, West Virginia. Lillie F. HAGAR was born on 10 Jul 1884 in , Boone, West Virginia. Troy Henry HOPSON [Parents] was born on 31 Jan 1904 in Lavaca, Sebastian, Arkansas. He died on 14 Aug 1996 in Selma, Fresno, California. Troy married Della Faye FERGUSON. Della Faye FERGUSON [Parents] was born on 7 Jan 1913 in , Franklin, Arkansas. She died on 15 Oct 1998 in Selma, Fresno, California. Della married Troy Henry HOPSON.